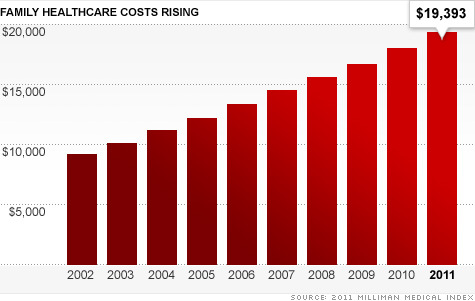 Health care costs for a family of four have doubled in less than a decade from $9,235 in 2002 to over $19,000 in 2011. 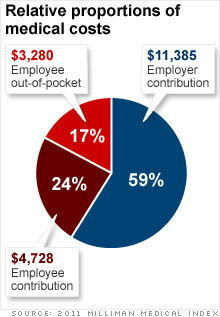 Of the $19,393 overall annual cost, employees' share is inching closer to 50%, said Lorraine Mayne, principal and consulting actuary with Milliman. "Employees are paying $8,000 of the $19,000. That's a decent amount much larger than other areas of consumer spending," said Mayne. "What we've observed in the past few years is employers have increasingly been offering health plans with higher deductibles and co-insurance, co-payment limits," she said. Companies are doing this in order to control their own costs and to force workers to use medical care more selectively, she said. Health reform so far has had very limited impact on curtailing these costs, said Mayne. While reform's new provisions such as eliminating lifetime benefit limits and removing copays on preventive care have changed rules for who pays for cost of care, they haven't made any impact on the total costs of care, she said. Most expensive parts of your health care: The report showed that physician costs represent 33% of a family's overall health cost. Elsewhere, hospital inpatient costs account for 31%, out patient costs 17% and pharmacy costs 15% and other expenses such as for medical equipment about 4%. Milliman also looked at 14 cities across the United States where health care expenses are substantially higher than the national average. Among them, Miami, New York City, Chicago and Boston ranked as the top four where health care costs for an insured family of four is more than 100% higher than the national average of $19,393. But those same costs in Phoenix, Atlanta, and Seattle are under $19,000, the report said. The Milliman Index is based on industry data and a survey of more than 4,000 employers.